"He's more than a good musician ... the word is style." 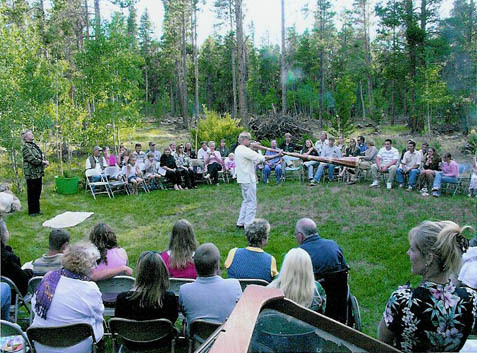 Michael Stanwood entertains audiences of every kind. 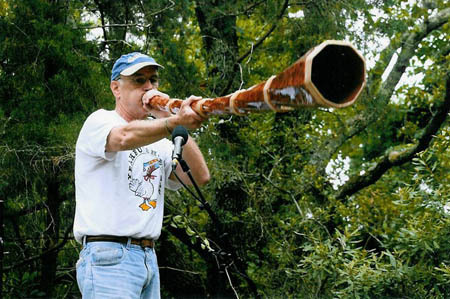 He has traveled to far corners of the earth and brought back curious and beautiful instruments, which he plays! Not only that, he invites his audience to play them as well. A concert with Michael is a journey through sound and culture, a journey filled with joy and laughter. Everyone gets involved... Michael has been pummeled with every vegetable known to the human race, though none of the Genetically Modified variety. Enjoy the music and pictures here. Get to know this award winning performer and composer, artist in residence and orchestrator of Buzz. See the other side of Michael Stanwood through his highly acclaimed photography, "Sky Messengers" soon to be compiled and published. Get in touch to buy CDs and photographs or to book performances, residencies and seminars. I love performing and working with students and teachers, writing songs with them about what they are studying. (website under construction: www.songstolearnby.com) Some of these songs have been incorporated into lesson plans by the Morgridge School of Education at their CRISPA site; (Connections, Risk taking, Imagination, Sensory experiences, Perceptivity, Active engagement). I love collaboration and serving other’s performing and recording projects. I especially love working with dear friend and sound wizard, Mickey Houlihan, on multi media installations, as well as recording. ‘Ulamani’, is the title of one of our projects which translates into the heart’s ability to hold great joy and great sorrow at the same time. ‘The Color of Sound’ was recently up at the Museum of Outdoor Art, and ‘Upwelling’ by the Many Rivers Ensemble is soon to go up on iTunes with video. I continue to play the monthly meditation at the Boulder Library theater. 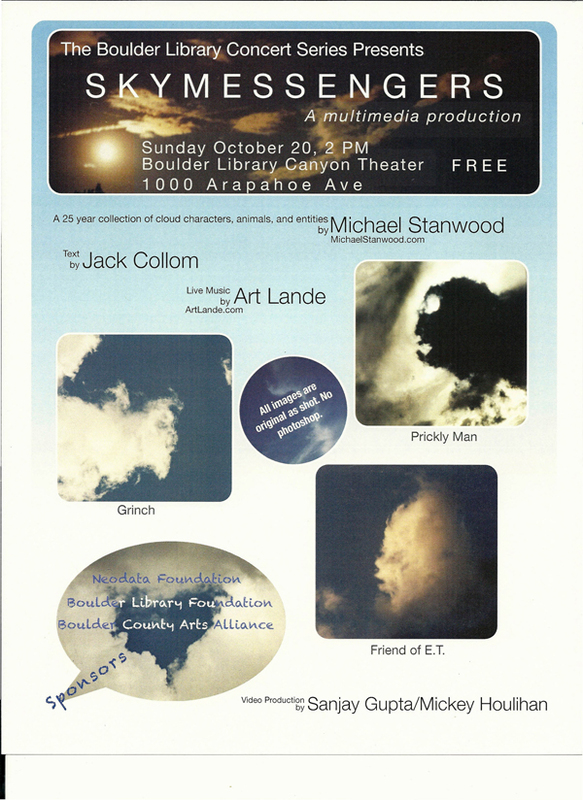 With the generous help of a Neodata Foundation grant, I am very invested in a multi-media video project titled, ‘SkyMessengers’, the result of a long lived passion for photographing clouds, and endowed with the wonderful words of poet, Jack Collom. Look for the production of ‘SkyMessenges’ in October of this year.